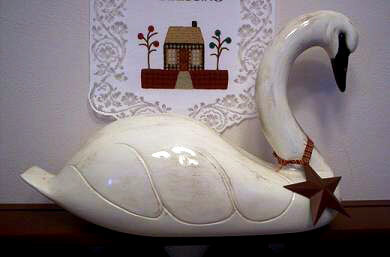 Included in our Holiday Swans Collection is the Folk Art Star Swan that has been given the "aged" look, offering a more distressed and antique appearance. The neck ornament is made of a country cloth ribbon and star to complete the rustic look. Other options could include homespun cloth ribbons with metal or wood stars, hearts, or even gingerbread cutouts. For antique and cabin lovers, this look completes any fireplace mantel, hearth, or porch. Using bass wood, our swans are hand carved, hand painted, and polyurethane sealed giving them a glossy finish and a pleasurable satin feel.